May’s games section roundtable is all about tower defense games. This genre of game is super versatile and great for those of you who want to get into gaming for the first time. I sat down with Jo Fu to chat about our love of these games. Al Rosenberg: A “tower defense game” is a kind of real time strategy game in which players try to stop enemies from reaching the “tower” by killing or diverting them. There’s not always an actual tower though; sometimes the goal is to stop them before they steal all of your sheep, get into your house, or get through the exit. Jo Fu: I love a tower defense games. Waves of enemies walk down a set path, and you try to kill them with various units before they reach the end of their march. You either build attack towers along a set road (à la Kingdom Rush series or Ninjatown for the Nintendo DS) or create your own path to drive mobs—Lemmings-like—through your gauntlet of towers. Mazing, as this is called, is largely beholden to real-time strategy games like StarCraft or Warcraft, the progenitors of the modern tower defense game. Al Rosenberg: I think the first tower defense game I ever played was probably a flash game I found online. Do you remember the first you ever played? Jo Fu: It was definitely a build of “Jungle TowerDefense,” a mod for Warcraft 3. The game was simple—you mazed a bunch of creatures through a huge variety of towers. The action was fast-paced and really kindled my love for the genre. Al Rosenberg: I think what makes a tower defense game enjoyable is the time restrictions. Like, having to make decisions quickly and trust your instincts toward strategy. Jo Fu: The constant sense of stress and panic, with occasional breathers, plus a shifting strategy as different kinds of mobs attack and different towers become available. It’s a game design that depends on flavor and pacing: easy to play and hard to master. Al Rosenberg: That’s definitely true, and I think certain games really take advantage of that with sliding difficulty levels and trophies for especially difficult tasks. What’s your favorite tower defense game? Jo Fu: Ooh. Kingdom Rush has taken a ton of otherwise productive hours away from my life, but I still miss those older modes of Warcraft 3 mods. There’s a special feeling of glee when you install a new mod, not knowing if you’ll love or hate it. But because it’s labelled “tower defense,” you have a good idea of what kind of game you’re going to play. 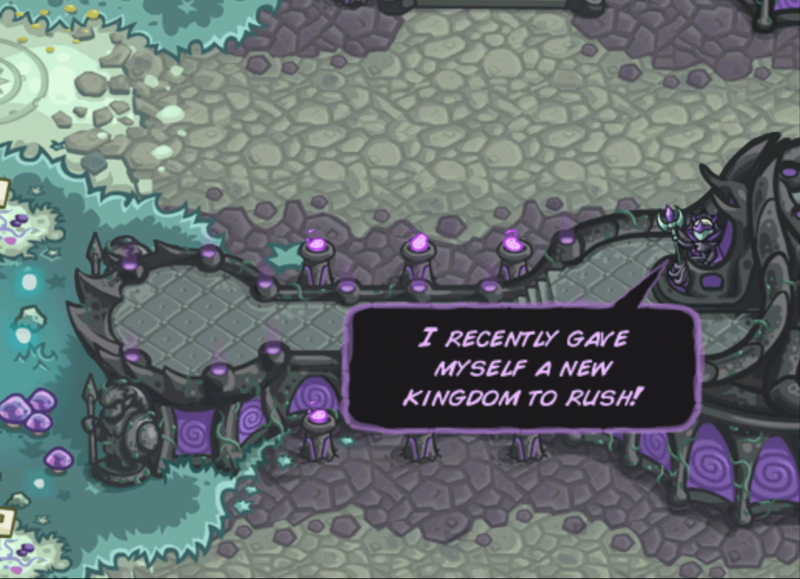 Kingdom Rush Origins—such an annoying and adorable villain. Al Rosenberg: AHHH! YES, Kingdom Rush! The whole Kingdom Rush series is excellent. I’m currently working on one hundred percent completion of Kingdom Rush: Origins (which is the newest, and probably strongest, addition to the series)—so, like all of the funny little achievements you can unlock and all the trophies for perfect scores. I’m playing through on the highest difficulty right now, and it’s actually really tough! I think my other favorite series is Plants vs. Zombies. It’s just so clever and cute and playable. Do you go in with the same strategy for all tower defense games? Jo Fu: If there’s something wrong with area debuffs and slow tower combos, I don’t want to be right. Al Rosenberg: Haha, yeah. I feel that. I usually start out the same way and only really veer off the path when it stops working. What tower defense games would you recommend to beginners? Jo Fu: I’d encourage anyone to try one of the lovely mobile tower defense games that has come out in the past year, whether you prefer the cute art of Kingdom Rush or the more old school vibe of Fieldrunners. The concepts are easy, and I feel that modern tower defense games scale in a way that’s more inviting to new players. Al Rosenberg: I’d also say to definitely check out Plants vs. Zombies. There’s a free version online, and I think it’s super accessible, control-wise, and to non-gamers. Dungeon Defenders is another super fun one and really great for playing with a party. It’s definitely a tower defense game, but it combines elements of an action-y role-playing game. So, that might be the one to try if you’re into games like Final Fantasy. Oh! And Orcs Must Die! is a great one for two-players. It’s a dungeon defense, but pretty quirky and well-paced learning curve. So, that’s it for us, folks. What games would you all add?